Madonna facebook page is celebrating the 25th anniversary of “True Blue” with a contest for a chance to win a personalized signed copy of Madonna’s “True Blue” album! Madonna’s Hard Candy Fitness website is now up and running including a section called Hard Candy Land where Madonna will be posting her favorite playlist to work out. Visit Madonna’s Hard Candy Fitness website! Billboard Magazine lists 20 Great Gay Moments In Music including stars paying tribute to Freddie Mercury, Ricky Martin revealing his homosexuality, Elton John, Lady Gaga and Madonna. Rumour has it Madonna has allegedly refused to work with Lady GaGa producer RedOne on tracks for her new album. How blah is that? 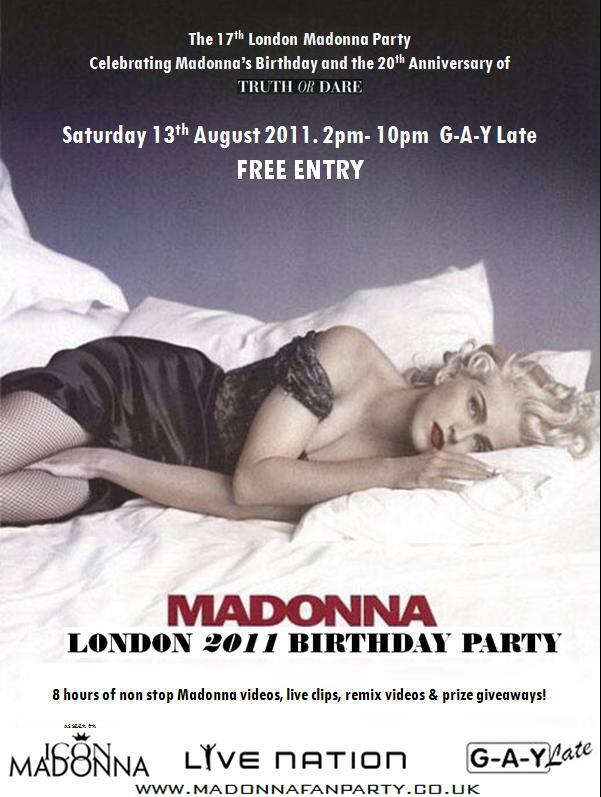 Madonna’s London Birthday Party will be held at G-A-Y Late in Goslett Yard (next to Tottenham Court Road tube station) on Saturday 13th August 2011, with doors opening at 2pm and the party celebrations going on until 10pm. 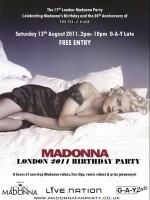 This is the 17th London Madonna Party, and as usual entry is FREE! The prize giveaways are free throughout the afternoon and evening – you just need to be in the venue at the time of the prize draws to WIN Madonna goodies. For more information please visit madonnafanparty and don’t forget to RSVP on the Facebook Event Page! Jellybean Wotupski!!?! LIMITED EDITION of 2000 CD’s is in stock and shipping. Contains bonus tracks and a 16 page booklet with 5000 word essay and interviews with various artist involved in this project! Available for $9.99 at GoldLegion.com for a limited time.